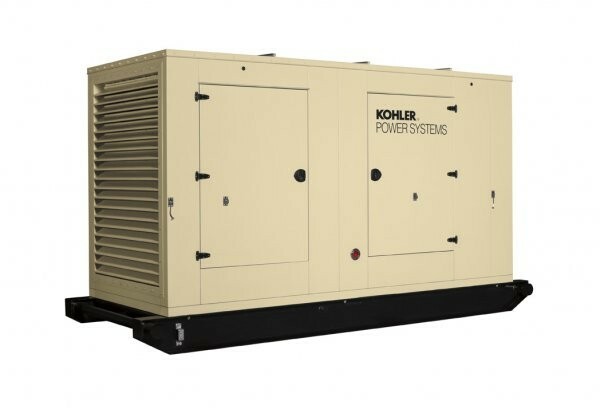 How did Kohler Power Systems totally rethink a wellhead-gas-powered field unit? First, engineers spent extended time in the field working with customers and Kohler Distributors, including Collicutt Energy Services based in Red Deer, Alberta. In terms of “process,” Landes is referring to a series of steps often coordinated by the customer: a local distributor buys a generator from a factory and an enclosure from another company, shipping has to be coordinated, a skid has to be fabricated, an up-fit shop assembles it all, and – finally – the unit has to be transported to the field. With reliability in mind, the re-design started with a robust field skid with integrated pull bars and attachment points for easy transport. A reinforced all-aluminum enclosure withstands impacts. Heavy-duty hinges and latches handle tough treatment. The 5-gallon oil make-up system and exhaust silencer are pre-mounted inside for protection and a cleaner appearance. The heavy-duty air filter includes a pre-cleaner to remove environmental dust, and the bypass oil filter extends the life of the oil and reduces oil change frequency. This Oil & Gas Field Unit also includes a fully potted controller with integrated paralleling for simple, plug-in paralleling capabilities. Collicutt Energy Services became a Kohler Power System distributor in Canada last spring. “Collicutt is very focused on their customer’s needs and were a wonderful partner to have as we redeveloped this new prime power unit,” added Landes.